Editor’s Note: This article contains spoilers for Episode 5 of ‘Patriot Act with Hasan Minhaj’. The latest episode in the political comedy opens with Minhaj showing off his Air Jordan 3’s and a joke at his own show’s expense, not unlike the past five openings. 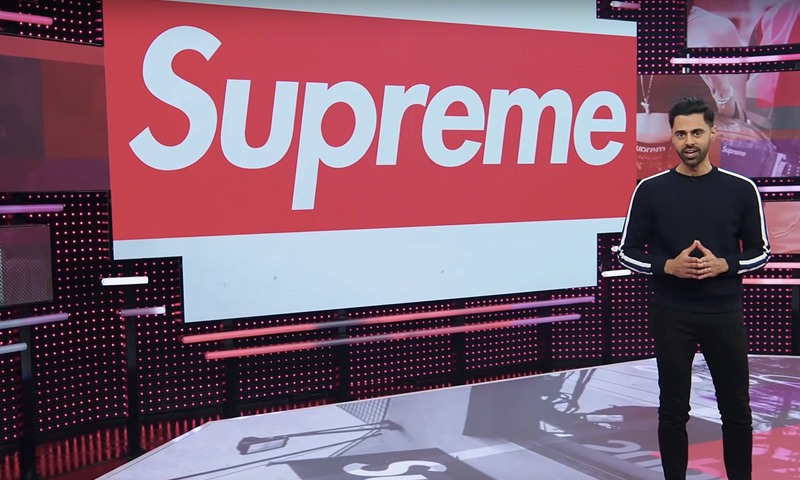 This week, he discusses the evolution of Supreme, the streetwear brand and its “iconic box logo” with the same enthusiasm that has been a continuous thread running through all of the previous episodes. It’s refreshing to see a Netflix Original that is this consistent through six episodes. In the second episode, Minhaj referred to his show as a “woke TED talk,” a concept that has stuck with the show through all the episodes and we can clearly see it in the way he fleetingly jokes about a fictional Indian, ‘Kabir’ and his misuse of the N-word. He’s not afraid to call out his own culture and the problematic aspects of it (as seen later when he brings up Gandhi’s treatment of South Africans), something I appreciate a lot. Yes, it’s fleeting and intended to be funny but it’s also a powerful, painful reminder that we all have room to improve. He could have conveniently ‘forgot’ about the reality of Gandhi or the racism within Asian and Indian communities but he didn’t. “Hype is kind of a big excitement that has a deep emptiness at its core,” sets the tone of the case against Supreme. The jokes to follow aren’t crowd-pleasing jabs at something that’s easy to mock, but a foreshadowing of the darker parts of Supreme that he is going to discuss (not just the ‘Supremium’. It gets a lot darker). After exposing James Jebbia’s past as a Build-A-Bear Workshop colonizer and the truly messed up nature of the resell market as well as Bashar Al-Assad’s own past on The Bachelor, he introduces the audience to the history of streetwear and ‘lifting’ culture. The excitement in his eyes as he reveals these shocking truths is palpable like he’s experiencing the anticipation of the next joke with the audience. It could be scripted, Minhaj could just be a very good actor but it makes the show and the experience of watching it all the more genuine which is ironic since this episode is about Supreme, a clothing empire built on ripping another artist’s style. I think, rather than being focused on Supreme, this episode really centers on irony. Irony as in the way a brand used anti-consumerist art to sell their products and that same brand is taking people to court on grounds of plagiarism. Irony like if Gandhi made an all-you-can-eat restaurant. I think this is probably what I love the most about the episode, the way the jokes almost tell themselves but then he falls flat. While Minhaj’s interview with the sneaker expert was not the best, he picks himself back up again with the “Joe Biden Hug” and “Thorstein Veblen, the OG Hypebeast” gags and remains consistent onwards. After his short economics lesson, comes probably the most self-aware moment in any of the episodes, where he directly addresses the different people in the audience, calling the situation a “taste cluster.” Minhaj managed to redeem himself from the sneaker expert interview in the same episode, something many comedians struggle at. However, this is a prologue to the dark reality of the Carlyle Group. Episode six is the culmination of a growing self-awareness in the series and while it isn’t perfect, it’s consistent in its quality. The episode ends with a promotion for Minhaj’s new merch line, The Carlyle Supremium (now sold out), the cherry on the top for this irony-centered episode.